MATHY-M Increases the Performance of Your Motorcycle Engine! Adding MATHY-M Engine Oil Additive to motorcycle oil improves its lubricating performance and reduces wear in the engine. The result is a smooth running of the engine with considerably less vibrations. Those who know their engine will feel the difference. On warm days MATHY-M keeps the oil temperature low due reduced internal friction and ensures the adhesion properties of the lubricating film. In the cold temperatures in the winter MATHY-M increases corrosion protection and protects the metal surface inside the engine against the forming of a rust film. What are my benefits of using MATHY-M? MATHY-M reduces internal friction, lowers the oil temperature and thus reduces wear. In addition, it keeps the engine clean from the inside. Lower repair costs and a longer service life are the results of regular use. Why is an internal engine cleaning necessary? Over time deposits appear in the engine. MATHY-M dissolves these deposits and keeps the engine sustainably clean. 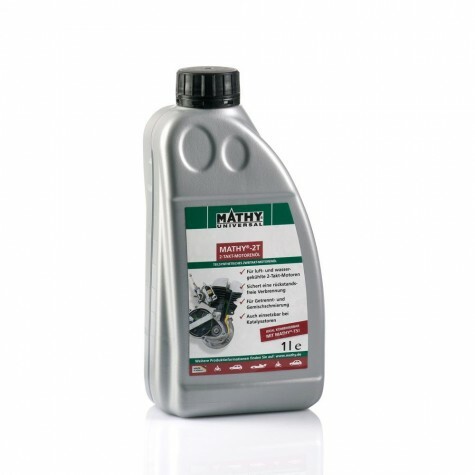 Due to a strong cleaning effect it is recommended to perform an internal engine cleaning with MATHY-C after 30,000 km. How can I perform an internal engine cleaning? Before the next oil change drive the car for about 20-30 minutes until the engine has warmed up. Then add a can of MATHY-C to the warm engine oil (400ml is sufficient for 5 liters). Afterwards let the engine run in idle mode (don’t drive!) for 10 minutes. Thereafter carry out a complete oil change and again add 10% MATHY-M. In which engines can MATHY-M be used? MATHY-M is suitable for all petrol/gasoline and Diesel engines with/without catalyst and Diesel particle filter. You can also use MATHY-M in trucks, construction machines, ships, CHP units, and all other engine-powered machines. MATHY-M is suitable for which engine oils? MATHY-M can be used in all mineral, partly-synthetic, and fully-synthetic engine oils, i.e. SAE grades 0 - 60. MATHY-M can also be used with special oils, like longlife or race oils, as well as oils based on esther. MATHY-M is a latest technology high-performance motor / engine oil additive. Without containing solid lubricants it significantly improves the quality of mineral, partly synthetic, or fully synthetic motor oils ranging from 0 – 60 SAE. By adding MATHY-M to the engine oil an optimum lubricity is established. The engines run smoother and wear is reduced to a minimum. DropStop contains the necessary plasticizers (elastomers) for rubber seals in a highly concentrated form and supplies them to the sealing material. The rubber seals become soft again, swell, and an existing oil loss can be stopped. DropStop is well suited for a preventive use in vehicles and machines that are older than 5 years. MATHY-TS two-stroke additive is characterized by excellent wear- and corrosion-protection properties. By using an extremely powerful additive combination, friction is reduced and engine wear is prevented. The special additives impede the formation of deposits in the combustion chamber, on the spark plug, on the exhaust slots, and in the exhaust system. Excellent engine cleanliness also prevents the formation of smoke in the exhaust gas. It makes it easier to start the engine and results in a smoother ride. MATHY-2T Two-stroke Oil is a high quality semi-synthetic 2-stroke engine oil for the use in all air- and water-cooled 2-stroke engines. The combination of selected base oils ensures a good lubricity and prevents increased friction in the engine. The low-ash composition of the basic components impedes increased smoke development. MATHY-2T Two-stroke Oil is a perfect base oil for the use with the two-stroke additive MATHY-TS.